The Jehoash inscription: Relic or forgery? Another really neat 20th century forgery? 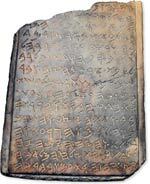 This inscription is carved into a rectangular Arkosic sandstone tablet, about 12 x 24 x 3 inches (30 x 61 x 8 cm). 1 It consists of 10 or 15 lines 2 of text in ancient Hebrew, written in ancient Phoenician script. The inscription discusses repairs to King Solomon's temple. If it had been authenticated as dating to the 9th century BCE, it would have been a unique piece of physical evidence which confirmed the accuracy of portions of 2 Kings in the Hebrew Scriptures (Old Testament). It would also have profound political implications. Jewish and Christian sources believe that the temple of Solomon was located on the Temple Mount in Jerusalem; Muslim sources deny that a Jewish temple was ever located near the Haram as-Sharif, (Noble Sanctuary) on the mount. "The mosque compound is Islam's third-holiest site, while the adjacent Western Wall, the last remnant of the second Jewish Temple compound, is Judaism's holiest site. Most rabbis ban Jews from entering the Temple Mount for religious purity reasons." 3 Rabbis are concerned that a visitor could inadvertently step on the location of the Holy of Holies; this would be considered a sacrilege by Jewish religious authorities. As in the case of the recently found bone-box of James, the origin of the tablet is not known. Experts have concluded that both are very cleaver forgeries. One individual, Oded Golan first presented the inscription to the world and is the current owner of the bone box. He was arrested on 2003-JUL-22 by Israeli police and charged with forgery. The dark gray sandstone tablet is rectangular -- about one foot by two. A rumor was circulated that the object was found during renovations in the Haram as-Sharif Sanctuary. The director of the Islamic Trust which administers the Jerusalem mosque compound, Adnan Husseini, denied this. "In the seventh year of Jehu Jehoash began to reign; and forty years reigned he in Jerusalem....And Jehoash did that which was right in the sight of the LORD all his days wherein Jehoiada the priest instructed him. But the high places were not taken away: the people still sacrificed and burnt incense in the high places. And Jehoash said to the priests, All the money of the dedicated things that is brought into the house of the LORD, even the money of every one that passeth the account, the money that every man is set at, and all the money that cometh into any man's heart to bring into the house of the LORD, Let the priests take it to them, every man of his acquaintance: and let them repair the breaches of the house, wheresoever any breach shall be found. But it was so, that in the three and twentieth year of king Jehoash the priests had not repaired the breaches of the house." "And they gave the money, being told, into the hands of them that did the work, that had the oversight of the house of the LORD: and they laid it out to the carpenters and builders, that wrought upon the house of the LORD, And to masons, and hewers of stone, and to buy timber and hewed stone to repair the breaches of the house of the LORD, and for all that was laid out for the house to repair it. Howbeit there were not made for the house of the LORD bowls of silver, snuffers, basons, trumpets, any vessels of gold, or vessels of silver, of the money that was brought into the house of the LORD: But they gave that to the workmen, and repaired therewith the house of the LORD. Moreover they reckoned not with the men, into whose hand they delivered the money to be bestowed on workmen: for they dealt faithfully. The trespass money and sin money was not brought into the house of the LORD: it was the priests'. " Gabriel Barkai, a biblical archaeologist, said that the correlation of the inscription with the Scripture text "has far-reaching implications of the historical importance of the biblical text." 5 He said that if it can be proven to be authentic, it would be considered one of the greatest Israeli archaeological finds in history, and would offer, for the first time, physical evidence of the existence of a Jewish Temple on the Temple Mount in Jerusalem. 1 and 2 Kings was originally a single book, which was subsequently divided into 1 and 2 Kings by the translators of the Septuagint -- a Greek language version of the Hebrew Scriptures. Most biblical scholars believe that the 1 Kings was not written at the time of King Jehoash in the 9th century BCE, but was composed centuries later. There is a near consensus that the unknown author of Kings relied heavily on historical documents, and incorporated them into his writing. He criticized the use of the phrase "bedek bayit." Whoever created the inscription did not understand what it meant in biblical Hebrew. He explained: "In the language of the Bible, 'bedek' is the cracks in the building. You reinforce the 'bedek habayit.' ... If you do 'bedek bayit' you are making a crack in the building and ruining it. 'Bedek habayit,' in the language of the Bible, is the problem that must be repaired. Someone who understands biblical Hebrew would not have used the later expression [in modern Hebrew, it means making repairs] that was derived from this expression." He continued: "vehaya hayom hazeh le'edut" [and may this day be testimony] makes strange use of the word 'edut.' "The word 'edut' doesn't exist in ancient biblical Hebrew, i.e. during the First Temple period, except in the meaning of 'brit' [covenant], as in the 'aron ha'edut' [the Ark of the Covenant]." The expression used during that period for the word 'edut' in its present meaning is 'ed' [which today means witness]. This issue, too, in my opinion, proves that it's a forgery." 57% believe that the tablet came from the Solomon's Temple. 8% believe it to be a fake. The stone was accidentally broken during shipment to an Israeli police station, even though it was protected by two layers of bubble wrap and placed inside a box. Osnat Guez, spokeswoman for the Antiquities Authority, said that the damage to the stone could be helpful, because it would enable scientists to study the inner layers of the stone to determine its age. The Associated Press announced on 2003-MAR-5 that Israel's Antiquities Authority had created two separate commissions of archaeologists, conservators, geologists and language experts. One committee studied "the scientific aspects in the writing and style" of two items: the inscriptions on the tablet and the James ossuary which some believe once held the bones of James, the brother of Jesus. 12 . The other committee studied "the originality of the patina in the engraving and the ossuary itself." The patina is a calcium-carbonate crust that builds up over time on soft limestone. 14 On 2003-JUN-17, the 14 scientists involved in the study announced their unanimous conclusions. The tablet and ossuary are ancient. That is, they were each finished from pieces of rock in ancient times. However, the inscriptions on both items are a modern forgery. Avigdor Horowitz, a biblical language professor who served on one of the investigating committees said that not one of the many inscribed passages on the tablet was without a linguistic mistake. "The person who wrote the inscription was a person who thinks in modern Hebrew. A person thinking in biblical Hebrew would see it as ridiculous." This will probably be the most definitive answer that the world will ever have about the nature of the ossuary and tablet. Sources differ on the number of lines in the inscription. Paul Benware, "Survey of the Old Testament," Moody Press, (1993), Page 106. J.D. Douglas, Ed., "Old Testament volume: New commentary on the whole Bible," Tyndale House, (1990), Page 431. Charles Laymon, "The interpreter's one-volume commentary on the Bible," Abingon Press, (1971), Page 181. James Adams, "Experts dispute ossuary findings," The Globe and Mail, Toronto, ON, 2003-JUN-19, Page R1.
" 'James ossuary' dealer suspected of forgery," 2003-JUL-24, The Toronto Star, Page A22.